Part two of the Saga of the Travels to the South of the Globe, in which our hero crosses the Tasman and arrives in New Zealand. After a short but interesting flight (It’s fun to see the cabin staff running around when they only have 1 hour to feed a filled Boeing 747) we arrived in Christchurch. There we were picked up by Brett, who had graciously offered to let us sleep over at his home in Lyttleton. In the evening, Brett’s son Jimmy took me and my brother to the local bar, called the “Wunderbar“. Quite an intriguing place. The following morning, he took us on a scenic trip to Akaroa, a historic French and British settlement nestled in the heart of an ancient volcano. Great views were seen. On Monday morning we set off with our rental car, heading for Queenstown. This trip took us across great views of the Southern Alps, the Remarkables, Mt. Cook, Twizel (not really great) and Bungy jumping loonies, before arriving at our destination. It has to be said that even though back home my brother had claimed to go bungy jumping, he never did. Bhah. 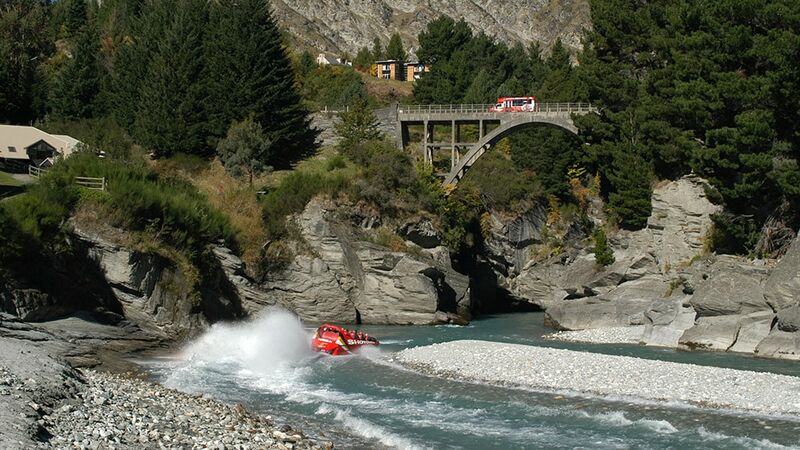 Whilst being there amongst other things we took a fun trip in a jetboat across the Shotover river. After returning to Lyttelton on Wednesday evening, we had a good night sleep before going on a day trip by train to Arthur’s Pass. Looking for a quick route to the West Coast, Arthur Dudley Dobson surveyed Arthur’s Pass in February 1864. Now it’s a national park, and we did some nice nature-ish walks involving lots of sun, trees and a waterfall. After returning to the train station in Christchurch, we had dinner at Hay’s, where they offered delicious New Zealand cuisine. If you’re ever in Christchurch, eat there. On Friday we went into Christchurch, and walked around the city centre, doing the usual souvenir shopping and sitting in the sun outside Starbucks, enjoying the live music. Saturday was our last day on the South Island. We drove up to Picton, where, the following morning, we would be getting on a boat heading for Wellington. It was a nice road trip, taking us along the east coast, passing the Pacific, Kaikoura, some seals, and lots of great scenery. Some parts of the road looked a bit like one of the circuits in Need for Speed: Hot Pursuit, but that could have been the computer-deprivation talking. To be continued in the final part.